Kashechewan sits on the flood plain of the Albany River. The Northern Ontario reserve of Kaschechewan is seen in this undated handout aerial photo. KASHECHEWAN, Ont. 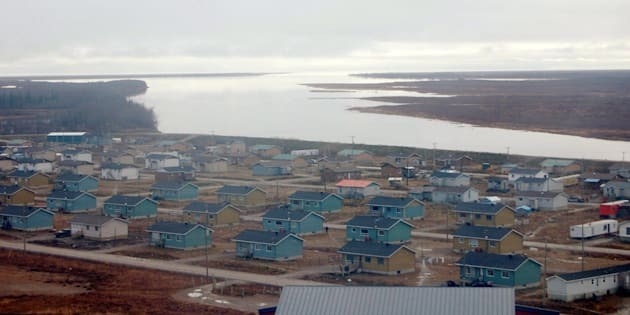 — Authorities are evacuating about 120 residents of Kashechewan First Nation on the west shore of James Bay due to ice break-ups and the risk of flooding. The provincial government has issued a state of emergency for the community and says the evacuation are a precautionary measure that "will continue as needed." The evacuees are being sent to Kapuskasing, more than 300 kilometres to the south. Spring evacuations have been an annual headache in Kashechewan due to the flood threat. Most recently, in both 2016 and 2017, several hundred people had to be flown to Kapuskasing and Thunder Bay due to significant ice jams upriver. In 2014, all 2,000 residents of the community had to be relocated until the flood threat eased.